SOLD OUT!!! AMAZING PRODUCTION of War Horse Wed 24th April 2019. Bord Gais Energy Theatre, Dublin. Return Bus Trip & Entry to War Horse Matinee (2:30pm). €63 / person. All the family welcome. Cost may reduce if numbers increase. You will be reimbursed the difference if this the case. AMAZING PRODUCTION ‘So exhilarating that it makes you rejoice to be alive. Sweeping drama of extraordinary power... Its sheer skill and invention are simply awe-inspiring.’ The Times. It's coming soon..that amazing Pony Camp Week!!! Book in asap so we can assess numbers and arrange instructors. Fort William Estate 8th - 12th July 2019. Click link below to submit an application. Theory required to prepare for your upcoming Pony Club Tests. Click on button below to select an option. XC Medical Armband. Click on button below to select an option. Irish Pony Club Sweatshirt. Click on button below to select an option. West Waterford Hat Silk. Click on button below to select an option. West Waterford Pony Club Polo Shirts. Click on button below to select an option. 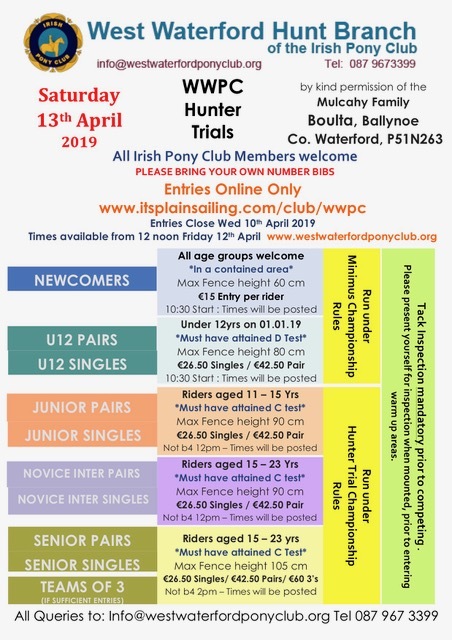 This is the online entries page for West Waterford Pony Club.